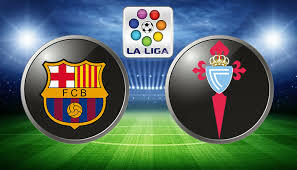 The current leader in the Spanish La Liga Barcelona welcomes Celta in a match from the 17th round of the league. Let’s take a look at this clash at the Camp Nou in the Catalan capital. Barcelona are leading the standings in Span with 34 points won and a record of 10 wins, 4 draws and 2 defeats. Right now Los Cules have 3 points advantage in front of the 2nd Sevilla and they’d like to keep this gap. And even increase it. In their last five matches Barca made one draw and suffered one defeat, but now they are in a run of three consecutive wins, achieved over Villarreal, Espanyol and Levante. It was a great spectacle against Levante in the previous round, when Ernesto Valverde’s team celebrated a terrific 5-0 win against the home side. Lionel Messi scored a hattrick for Barcelona, while Luis Suarez and Gerard Pique also scored for the champions. Celta on the other hand are currently 10th in La Liga with 21 points won. The team from Estadio Balaidos have a record of 5 wins, 6 draws and 5 defeats. In their last five games Celta won twice, lost twice and made one draw. This draw happened against Leganes at the Balaidos, where the game ended with a 0-0 draw. Celta still have a chance to aim for an European qualification. Right now they are just 4 points behind the 6th Getafe and the Europa League zone, so they are pretty close. Of course, they will try to reduce this gap, but against Barcelona at the Camp Nou it’s going to be very difficult. In our predictions about the La Liga clash between Barcelona and Celta we can say that Los Cules are the big favourites here. But this game won’t be easy for the Catalans.